It is really not all that hard to achieve a perfect roast if you have the proper ingredients and know a few basic techniques. A roast is great for serving large families as well as for single people who can transform a single roast into many different meals for several days eating. All you need, as far as equipment goes, is a rimmed baking sheet, large enough to fit a wire baking rack (like for cooling cookies), and either an instant read thermometer or a digital one with a probe (my preference). 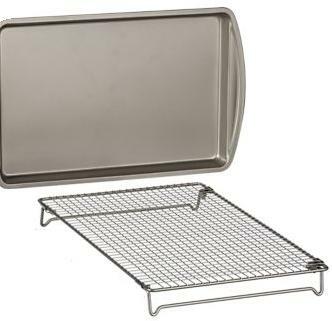 Make a roasting rack by placing a cooling rack inside a rimmed baking sheet. This set up allows for air to circulate around the roast so that it cooks perfectly on all sides without the hassle of turning it. The first technique for roasting that we’ll look at is brining. This is an easy way to tenderize and flavor meat for roasting. A brine normally consists of submerging the meat in a mixture of water, salt and sugar. Other ingredients can be added as well to flavor the meat. This method is especially good for making sure your Thanksgiving turkey comes out moist and delicious through and through. Use a large stockpot and stir together the water, salt, and sugar until dissolved. Now add the remaining ingredients and you have a brine for a 16 to 20 pound turkey! Rinse the turkey well and submerge in the brine a minimum of 6 hours, but up to 24. You may want to weight a plate to hold the turkey under the water. Store in the refrigerator while brining. Before roasting you want to remove the turkey from the brine and rinse well. Then let come to room temperature. Do not season the turkey, or any stuffing you may be using, with salt because the turkey will retain some of the salt from the brine. Also be sure to taste any gravy you make from the drippings before adding salt. 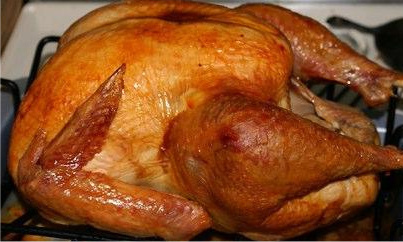 Preheat your oven to 325 degrees F. Place the turkey on your roasting pan breast-side up. You can use additional seasoning if you wish, but it is really not needed. 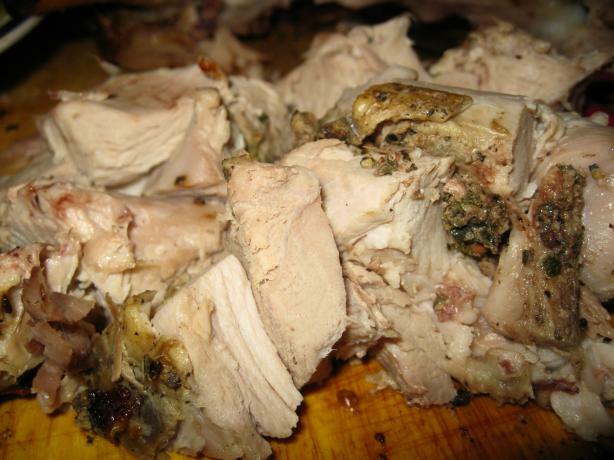 An unstuffed bird will cook about 1 1/2 – 2 1/2 hours (brined turkey cooks faster than unbrined). Just use your thermometer to make sure the thigh meat (do not touch the bone) registers 180 degrees F and that the juices run clear. The leg will actually look like its pulling away from the thigh. 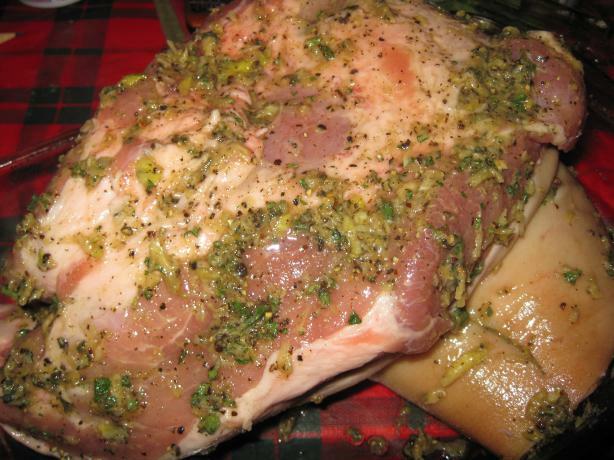 This recipe is for a bone-in pork shoulder, or pernil. It is marinated in a garlicky paste for 1 to 3 days; the longer the better. It is cooked at a relatively high heat so that the result is a tender roast with crispy skin. Place the roast skin side up and make several slits, about 1 1/2 inches long and as deep as possible; spoon some wet adobo into the slit. Turn roast and do the same with the other sides, then rub the adobo all over. Refrigerate, covered for at least one day, up to 3. Turn once a day at least. When ready to cook, preheat oven to 450 degrees F. Roast, skin side up, on a rack in a roasting pan for 1 hour; reduce heat to 400 degrees F and roast until the skin is deep golden and crackly (160 degrees on an internal meat thermometer), about 3 hours. Let rest at least 15 minutes before carving. To carve, first remove the crispy skin and cut into smaller pieces (you can use kitchen shears). Carve the meat, parallel to the bone, all the way through to the bone. In a small bowl, combine cayenne, rosemary, garlic, and enough oil to form a paste; rub paste into meat, then generously salt. In a roasting pan, toss the onions, carrots, celery seeds, and mushrooms with a little olive oil to coat, and salt to taste; add the wine and half of the chicken stock, and the bay leaf. Place the roast on top of the vegetables, bones down and fatty side up. Put in oven until nicely browned, about 25 to 30 minutes. Reduce heat to 350 degrees F and roast until the meat registers 125 degrees F (medium rare), about 1 to 1 1/2 hours, or to desired doneness. Occasionally during cooking you can baste the meat with the pan juices; if the pan gets too dry add the remainder of the chicken stock. Remove from oven and let rest 15 to 20 minutes before carving. Taste the vegetables and season as necessary. Often when I make a roast chicken I employ a preparation method that I think is called spatchcocking. I cut the back out of the chicken (use it to make chicken stock), then lay the chicken flat and press down to break the breast plate. This allows the chicken to roast more quickly and evenly. I also have been know to cut out the breast bones completely, if it is a small chicken, so that it is divided into two equal portions, such as in the following recipe. Fry the bacon until crisp, then drain on paper toweling; chop half the bacon and combine with chopped thyme and chopped rosemary, reserving the other half of bacon. Preheat oven to 350 degrees F; thoroughly rinse off the chicken inside and out. Place chicken on a cutting board and use kitchen shears to remove the backbone; turn chicken breast up and gently press to flatten somewhat. Gently ease the skin from the breast and season inside the pocket with salt pepper and 1/4 of the bacon herb seasoning and smooth skin back over the breast; season the entire outside with more salt, pepper, and 1/4 of the seasoning. Roast the chicken, on a rack, breast side up, placed over a baking dish for 45 minutes. Remove the rack and place the partially cooked chicken into the baking dish; surround with the carrots and potatoes. Roast until the chicken is done, internal temperature of 165 degrees F, and the vegetables are tender, about an hour; sprinkle with the remainder of the bacon herb seasoning and tent with foil about 10 minutes. Push the vegetables and chicken to one side in the pan; place beans and spinach into the other side of the pan and toss gently with chicken juices. Sprinkle spinach with reserved bacon, broken into pieces. 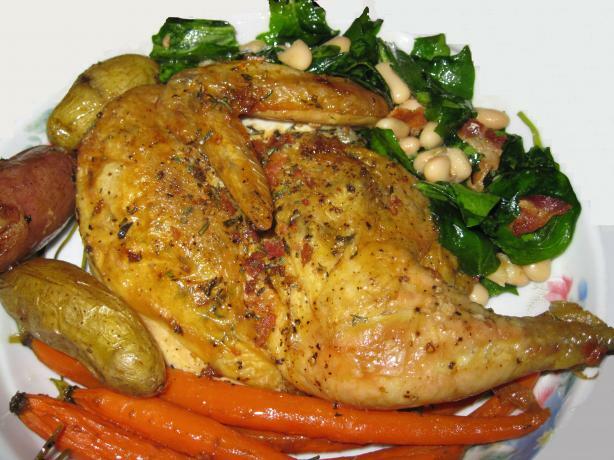 Cut chicken into 4 pieces and serve with roasted vegetables and warm spinach salad. In a small bowl, combine: breadcrumbs, rosemary,thyme, garlic, 1 teaspoon salt, 1/4 teaspoon pepper and 2 tablespoons of olive oil (to moisten the mixture); set aside. Use an oven proof skillet to heat 2 tablespoons olive oil over high heat. Sear rack of lamb for two minutes per side; set aside to cool slightly. Cover bones with foil to prevent discoloration during roasting. Brush Dijon over rack of lamb and evenly coat with breadcrumb mixture. Place lamb, bone side down back into pan and roast in oven for approximately 12-18 minutes (depending on how done you like your meat) use a meat thermometer placed into the center of the meat to check temperature. Remove meat from oven and let rest for 5-10 minutes, covered with aluminum foil, before cutting rack between ribs.